The stadium has approximately 18,000 seats. The stadium is 325 feet (99 m) down the left field line, 325 feet (99 m) down the right field line and 404 feet (123 m) to center field. The fences are 8 feet (2.5 m) high. 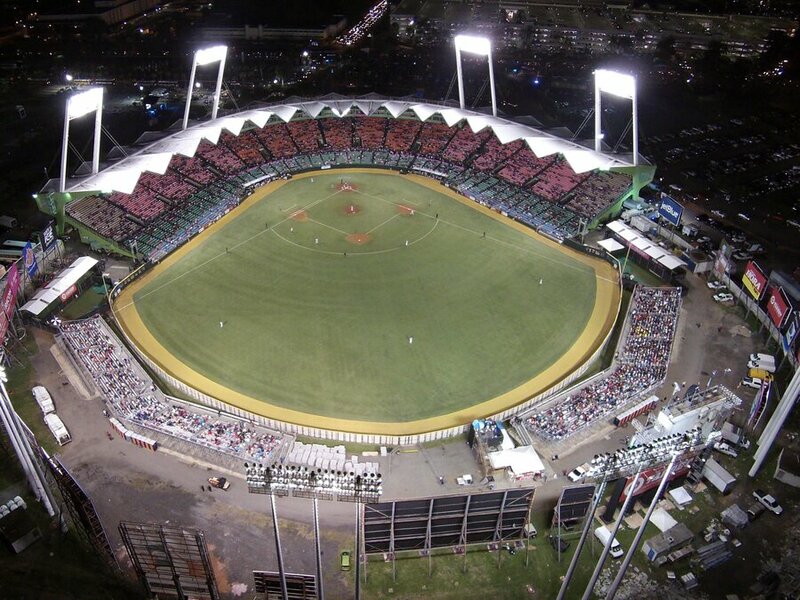 When the Expos played home games at Hiram Bithorn, the field dimensions were set to match Olympic Stadium in Montreal. The first outdoor National Basketball Association game was played between the Phoenix Suns and the Milwaukee Bucks on September 24, 1972 during that year's preseason. The Suns defeated the Bucks, 116–103. The stadium hosted Major League Baseball's Opening Day Game in 2001, in which the Toronto Blue Jays faced the Texas Rangers in an American League match-up. However, 4,000 who bought tickets were turned away when the police determined the safe capacity of the park had been vastly exceeded. It was the object of a major overhaul under the mayoral administration of Jorge Santini, before becoming the part-time home of the Montreal Expos of the National League in 2003 and 2004 prior to their move to Washington, D.C. as the Washington Nationals. The Expos played 22 "home" games in each season as a result of poor attendance at their home Olympic Stadium in Montreal. Prior to Major League Baseball's announcement of the Montreal Expos' move to Washington, Puerto Rico and San Juan made an effort to lure the Expos franchise to the island territory permanently. Hiram Bithorn Stadium hosted parts of the first two rounds of the 2006 World Baseball Classic. Pool C, which included the teams of Puerto Rico, Cuba, Panama, and the Netherlands, was played there. It also hosted Pool 2 of the second round of the Classic which featured Cuba, Puerto Rico, the Dominican Republic, and Venezuela, the top two finishers from Pool C and Pool D. Pool D games of the 2009 World Baseball Classic were played there between March 7 and March 11, 2009. The Hiram Bithorn Stadium hosted the 2013 World Baseball Classic with Puerto Rico, Venezuela, the Dominican Republic and newcomers Spain in Pool C.
In 2008, it served as the stadium for Atléticos de San Juan and Academia Quintana, two soccer teams in the Puerto Rico Soccer League, Puerto Rico's first ever professional soccer league. The Marlins were to return to play the Pittsburgh Pirates on May 30 and 31, 2016 in honor of Roberto Clemente Day. However, on May 6, 2016, it was announced that the Puerto Rico games would be postponed due to the ongoing Zika virus outbreak, and moved to Marlins Park. The Cleveland Indians and Minnesota Twins played a two-game series at Hiram Bithorn Stadium on April 17 and 18, 2018. It is the first time since 2010 that a Major League Baseball regular-season game was played in Puerto Rico. Along with sporting events, the stadium has hosted concerts by many famous artists. Metallica were scheduled to perform during their Nowhere Else to Roam Tour on April 28, 1993, but it was rained out and never rescheduled. Shakira has performed twice, during her Tour Anfibio, on April 9, 2000 and during the Tour of the Mongoose, on March 22, 2003. WWC Anniversary Show 1984: September 14, 1984. Attendance 34,383. ^ Vargas FAIA, Benjamin, ed. (2014). La Vereda Tropical / Down Where the Trade Winds Blow (in Spanish and English). San Juan, PR: AIA. ISBN 9780692324301. ^ U.S. National Park Service. "National Register of Historic Places Program". Retrieved August 26, 2017. ^ "Blue Jays beat up Rangers in baseball's season opener". CBC Sports. 2001-04-01. Retrieved 2009-03-27. ^ "MLB moves Puerto Rico series amid concerns about Zika virus". ESPN.com. Retrieved 6 May 2016.